66 Ft 200LEDs Waterproof starry fairy copper string lights USB Powered for Bedroom Indoor Outdoor Warm White Ambiance Lighting for Patio Wedding Decor Power Adapter Included by 12APM at EOS Lighting LLC. MPN: 43237-2. Hurry! Limited time offer. Offer valid only while supplies last. Good news! 12apm is now have 66 feet copper string lights to released. Each strand equipt with 1 USB port and comes with 1 USB power adapter. WHY US? - 12apm string lights adopt with Durable leds which can actually have a life time expectancy of about 100, 000 hours. This is approximately 11 years of continuous operation. 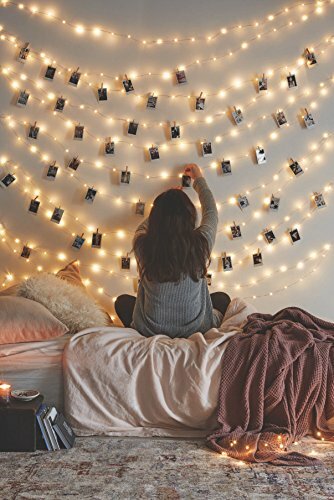 - This is a 66 feet string light with 200leds,the string lights will decorate your home, restaurant, cafe shops and create a romantic and welcome atmosphere for you. And you can image how great it is when you use the string lights for outdoor camping! Distance between lights: 3.5"
- Still wondering to spend more money to power it up? The strings lights design with an universal USB port, also bonus with a FREE Power Adapter (included)to operate. - 66Ft IP65 waterproof copper wire with 200 individual LEDs, 5 feet adapter cord with USB socket. 15.99 FOR PRI DAY ONLY- Made of waterproof and bendable copper wire that could be shaped into any symbols. They are also durable, work in synergy to offer greater coverage, and give of a light fairy effect in night without overheating. - Bonus with USB port power adapter for string lights. Backed with 3 years quality warranty( Adapter not included)! If you have any questions about this product by 12APM, contact us by completing and submitting the form below. If you are looking for a specif part number, please include it with your message.